Generally speaking, beaches on Kauai are so blessed and so beautiful. Unfortunately, however, accidents at beaches did happen many times here on this beautiful island. One of the most frequent accidents are said to be caused by a rip current which is a strong surface current flowing outwards from a shore. 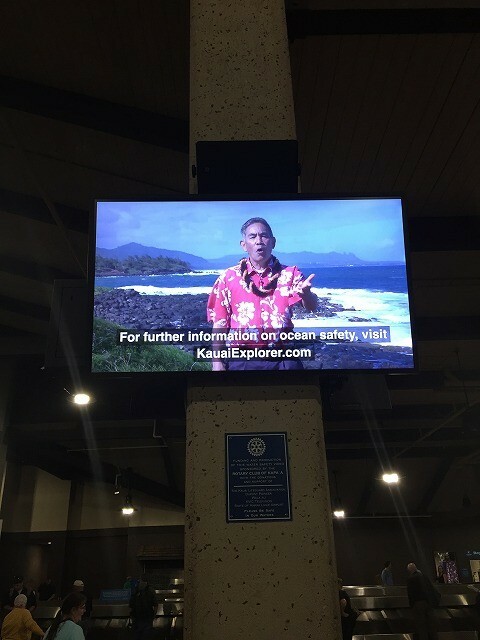 They say a rip current happens once in 100 meters in the shallow off the shore and if you are caught in this current, no matter how good swimmer you may be, you cannot swim against the current. Then in case you get caught in a rip current, what should you do? This answer should be very fatal because whether you can survive or not depends on whether you know it or not. 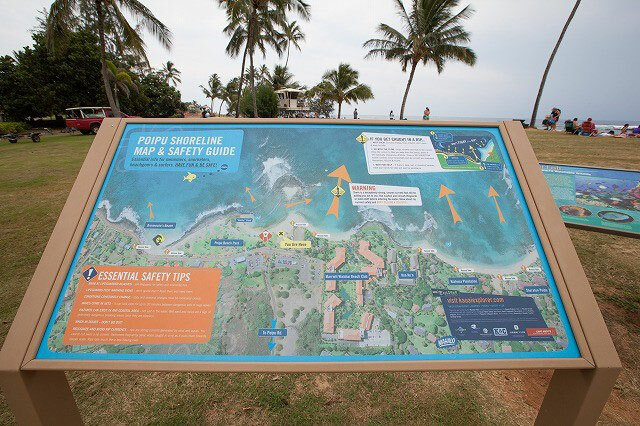 I'm very pleased to know there are more and more signs of the safety guide at the beach sites and information on this rip current are also being broadcasted through the medias. 1. Keep Calm. Conserve energy, float, breath, don't panic, and wave for help. 2. GO with the flow - relax, breathe and float in the current. Allow the current to take you away from the beach, where it will eventually release you offshore. There is no UNDERTOW (ocean current move horizontally and do not pull you donwward. Remember: Relax and Float. 3. Wait for help. If there is a large surf or shoreline hazards, wave your hands for help and wait for assistance. Another thing we should know about a rip is most rip currents are very narrow, according to the Wikipedia. So in case you caught in a current, you can easily get out of the flow by swimming parallel to the beach. But swimmers who don't know this fact become panic, trying to swim back to the beach and then exhaust themselves. In a rip current, death by drowning occurs when a person has limited water skills, or panics, or persists in trying to swim to shore against a strong rip current, thus eventually becoming exhausted. Ever since I knew these facts about a rip current, whenever I take my guests to the beach, I always talk about a rip current and essential safety tips. And I wish they can share this knowledge with their guests, too. As you know, this knowledge is not difficult. But it is such a simple knowledge that could save people from the rip current. And what we should do is to share this simple knowledge with much more people.